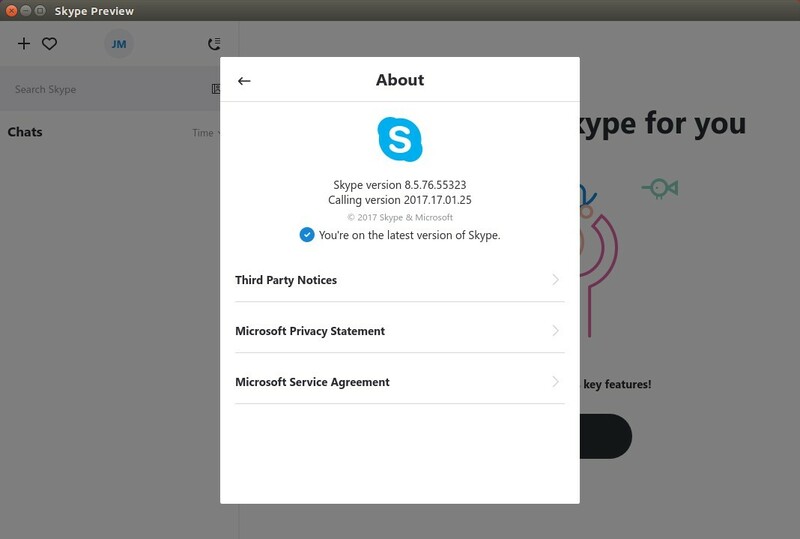 Microsoft announced the next generation of Skype in preview for Linux a day ago. The new Skype Preview, version 8.5, is released to unstable channel in official Skype repositories. It will receive regular updates and eventually becomes the new Skype. The new Linux client is going to get the same features as the Windows and Mac versions for the first time, so that is the reason for changing the client version number. Starting today, the next generation of Skype is available in preview on Linux shortly after it was introduced for Windows and Mac. It’s not yet complete and we need your feedback. We’re committed to providing a Skype experience you love, enhancing the way you talk, text, and experience the world—all from the comfort of your desktop. Skype Preview delivers most of the great features of our next generation mobile experience but is specifically designed with desktop in mind, to take full advantage of the larger screen. Skype Preview puts chat front and center—making this the most expressive Skype ever. You can also do more together in group calls, with real-time screen and photo sharing. And remove the Skype unstable repository using “Software & Updates” utility, under Other Software tab.